I recently had a chance to present at DeeveloperWeek conference in San Francisco. 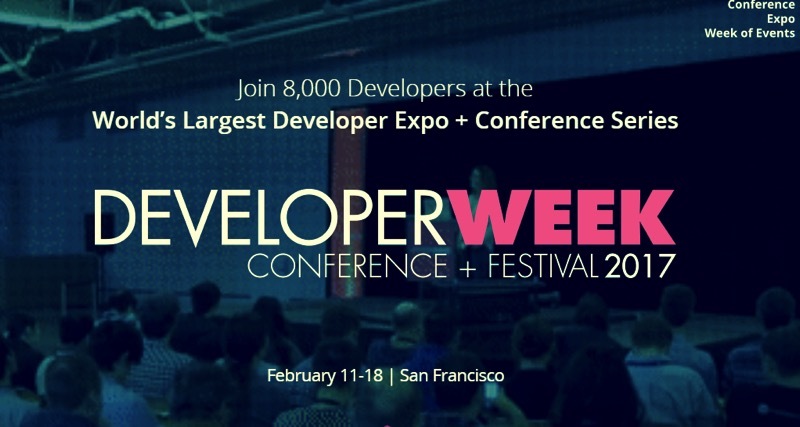 According to DeveloperWeek, it is the largest developer conference with 8000 attendees and hence I was pretty excited to represent and present Mozilla and talk about WebVR there. The conference took place in Pier 27. I had never been to a pier before so it was little weird to find actually a full blown conference building in a pier. My talk was on the second day of the conference and at 9 A.M slot (I really hate morning slots). That gave me chance to go around the conference and look at other talks in the first day, also roam around the expo, talking to different people getting an idea of the audience. I couldn’t quite justify the 8000 developer claim, but the conference definitely was big, sprawled on two floors. They had it divided among topic categories, my talk was part of the VR & AR section. But in real physical location it did not seem to make much difference. The talk’s were being held in specific stages which were sprawled among the very big open space and in between having different booth of companies. Though this setup allowed a lot of people to notice the stages, it also meant that there was enough ambient noise to interrupt the talk if you had too much audio-visual. I noted this and also marked out where I was supposed to deliver the talk, Pavilion 3 which turned out to be a big room in itself and I felt a little relief that I will not get interrupted by ambient noises. Which, was not really true. On the day of talk, I decidedly started early. At 7:15 to reach much before time (for a change). I was staying across the bridge, and decided even if I consider the traffic on bay bridge I still should be able to reach by 8, considering Lyft and Google Maps showed me it as a 20 minutes distance. How wrong I was. So after some frantic texts between me and the space wrangler where she kept assuring me they will handle the space for me if I am late, I managed to barely reach the venue at 8:59 AM. So much for me being early. While getting out of my Lyft and dashing for the venue, I heard a familiar voice calling my name. That was Michael! 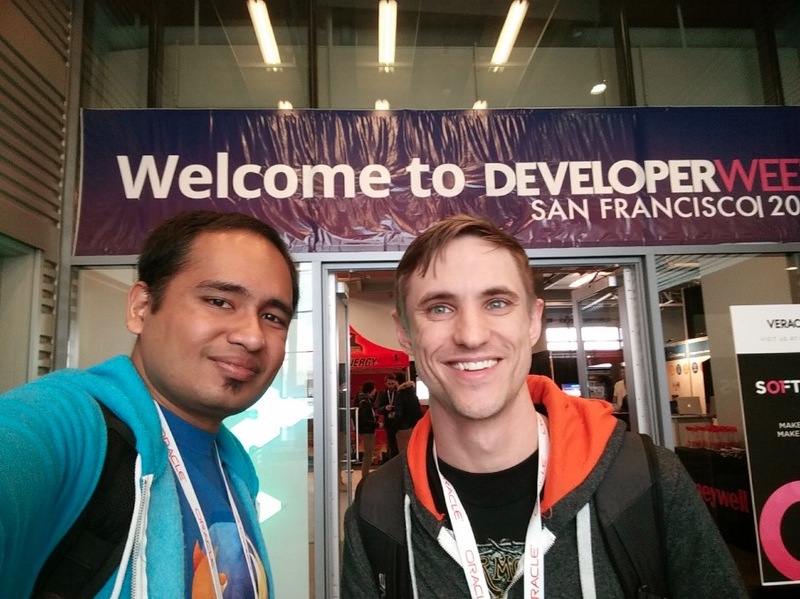 He came all the way from Mozilla Mountain View office to attend my talk! A minute or two later when I was plugging in my laptop for the talk I also saw Sandra from Mozilla SFO to enter the pavilion for the talk. I was so happy and that worked as a confidence booster for me. I eventually started the talk mostly on time and it went great including most of the demos (I need to come up with a better way to show that spotify demo). Sandra was so kind to snap a few pictures of me. I have hyperlinked the resources with the questions above which will take you to the answers I generally provided them. One general opinion was that since most of my demo’s were geared towards mobile in Google Cardboard, I could only talk about the interactive demos, but couldn’t actually show them. A suggestion I plan to address in at least some of my future talks. 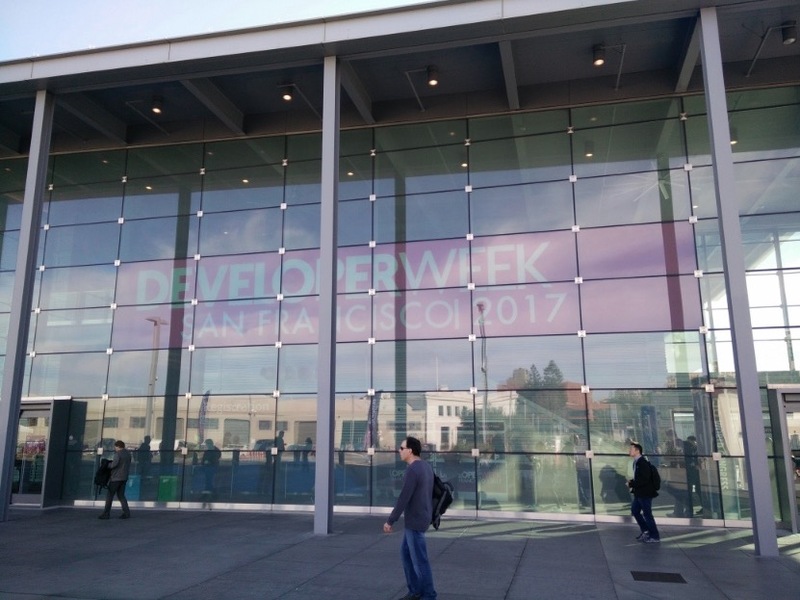 And that’s how I wrapped up the DeveloperWeek 2017. 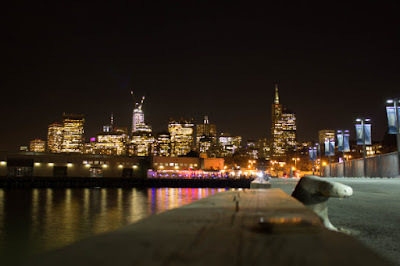 Of course I hanged around at the pier a few more hours to get a shot of how the city looks from the pier. 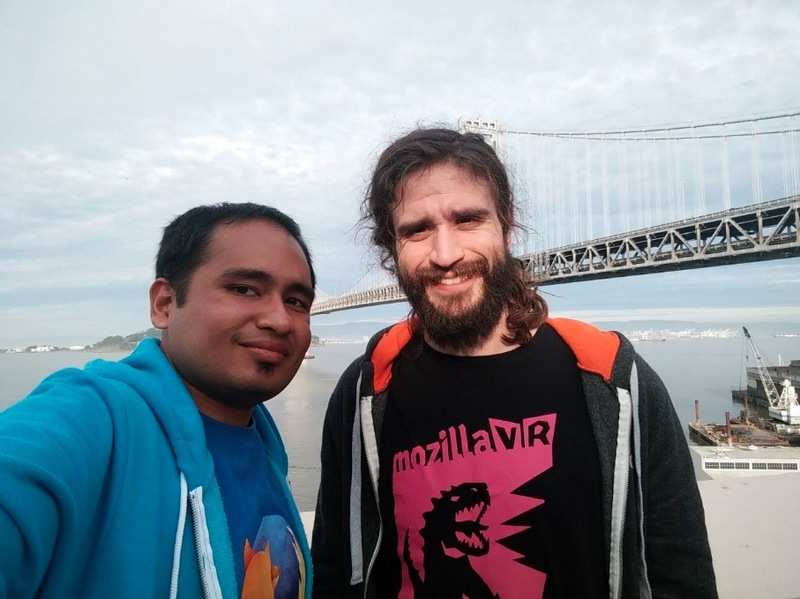 And how can my trip get completed without once going to Mozilla SFO office and meeting with Diego, trying out some Mozilla VR gear and having a sneak peak at A Saturday Night in WIP mode. It will very soon be released and you can have a blast at that time!